George Gilbert Scott was an English architect of the Victorian Age, chiefly associated with the design, building and renovation of churches, cathedrals and workhouses. He was one of the most prolific architects that Great Britain has produced, over 800 buildings being designed or altered by him. Scott was the architect of many iconic buildings, including the Midland Grand Hotel at St Pancras Station, the Albert Memorial, and the Foreign and Commonwealth Office, all in London, the main building of the University of Glasgow, and St Mary's Cathedral in Edinburgh. 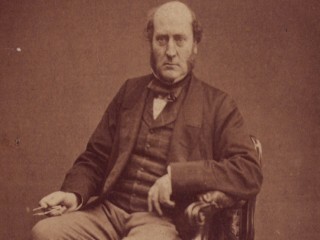 In about 1835, Scott took on William Bonython Moffatt as his assistant and later (1838–1845) as partner. Over the next 10 years Scott and Moffatt designed over 40 workhouses. Scott also designed working-class housing for Akroydon, Halifax in 1859. Meanwhile, he was inspired by Augustus Pugin to join the Gothic revival of the Victorian era, his first notable works in this style being the Martyrs' Memorial on St Giles', Oxford (1841) and the new St Giles' Church, Camberwell with its fine octagonal spire (1844). The choir stalls at Lancing College in Sussex, which Scott designed with Walter Tower, were among many examples of his work that incorporated green men. Later, Scott went beyond copying mediaeval English gothic for his Victorian Gothic or Gothic Revival buildings, and began to introduce features from other styles and European countries as evidenced in his Midland red-brick construction, the Midland Grand Hotel at London's St Pancras Station, from which approach Scott believed a new style might emerge. Between 1864 and 1876, the Albert Memorial, designed by Scott, was constructed in Hyde Park. It was a commission on behalf of Queen Victoria in memory of her husband, Prince Albert. Scott was awarded the RIBA's Royal Gold Medal in 1859. Knighted in 1872, he died in 1878 and was buried in Westminster Abbey. He married Caroline Oldrid of Boston in 1838. Two of his sons George Gilbert Scott, Jr. and John Oldrid Scott, and his grandson Giles Gilbert Scott, were also prominent architects. He was also related to the architect Elisabeth Scott. His youngest son was the botanist Dukinfield Henry Scott. Scott's success attracted a large number of pupils, many would go on to have successful careers of their own, not always as architects. In the following list, the year next to the pupil's name denotes their time in Scott's office, some of the more famous were: Hubert Austin (1868), George Frederick Bodley (1845–56), Charles Buckeridge (1856–57), Somers Clarke (1865), William Henry Crossland (? ), C. Hodgson Fowler (1856–60), Thomas Gardner (1856–61), Thomas Graham Jackson (1858–61), John T. Micklethwaite (1862–69), Benjamin Mountfort (1841–46), John Norton (1870–78), George Gilbert Scott, Jr. (1856–63), John Oldrid Scott (1858–78), J. J. Stevenson (1858–60), George Henry Stokes (1843–47), George Edmund Street (1844–49), William White (1845–47).